The illustrations are fabulous, full of color, realistic, expressive – and cute…. To whom would you recommend this book? This would be a fun addition to a pirate-themed storytime. “First she was a Bad Pirate (2015) and then she was a Good Pirate (2016) but now Augusta, daughter of Captain Barnacle Garrick, is on her way to becoming an even better pirate…. Readers will certainly learn a lesson from Augusta and Kari-Lynn Winters about determination and fulfilment that comes from success without the need for accolades. She may be a dog but she’s a gutsy lassy. 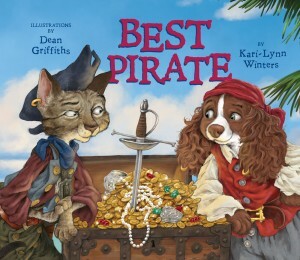 Dean Griffiths, who illustrated Kari-Lynn Winters’ earlier Pirate books, continues to endow the story with colour richness and opulent textures from another time…Of course, young readers will love the dogs and cats of all species with their distinguishing features of fur and shape as well as the wide array of their expressions: friendliness, fear, surprise, dismay, anger. “There is lots of lovely pirate language, and the end papers help define a lot of these for enchanted readers. The illustrations are wonderful, showing emotions and lovely details. The dogs are a variety of breeds, easily identifiable, and the cats range in type while still being entirely cats. And I love that the story shows how working together pays off.